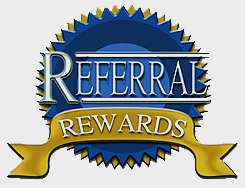 We would like to tell you about our Referral Rewards Program. Since we have obtained so much business from word-of-mouth, we want to reward you for telling your friends, family, and coworkers. For each new customer you send us, we will reward up to $200 gift card to a local store or restaurant near you. Anyone can be a part of this great offer. Real-estate Agents, Insurance Agents, & Contractors are all welcome. This is a great program were everyone wins. Simply refer your friends, neighbors, co-workers, or clients to our Referral Reward Program and we will reward you automatically when they sign with us. Just fill out the box below. We will send up to a $200 gift card to the store of your choice. There's also no limit on the number of gift certificates you can receive! Our Referral Rewards Program can also be applied to your own project from Atlanta's REAL Builders Inc. installations. Please fill out the fields below and submit the referral form Atlanta's REAL Builders Inc.